Warren Tales Blog: A Free Range Eggtravaganza! I'm always enthusiastic to participate in the fun crafting that circulates these times of year. It's pretty clear to me that friends will always make the best company; good food is always good eating; and we will all, always have loved ones to bury in presents, simply because they're wonderful. Because, if creativity isn't worth celebrating, then what is! 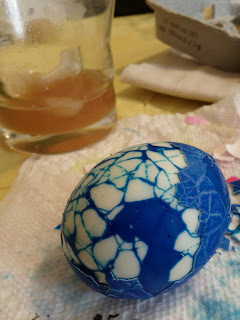 That being said, and it being the season of egg-birthing bunnies (riddle me that), I joined some friends from the Boston poetry circuit for an egg-ceptional round of egg-dying. The Stink-Bug: You simply crack the shell of a hard boiled egg, submerge it in your dye-mix until it's dark, and then remove the shell to reveal your "stinky" snack (circa Roald Dahl's Revolting Recipes, the single best book of my happy childhood). The Hungarian Folk: A traditional Hungarian practice of wax-resist dyeing, which uses a wax pen called an “íróka” (or kistka) to achieve negative space patterns and layering. 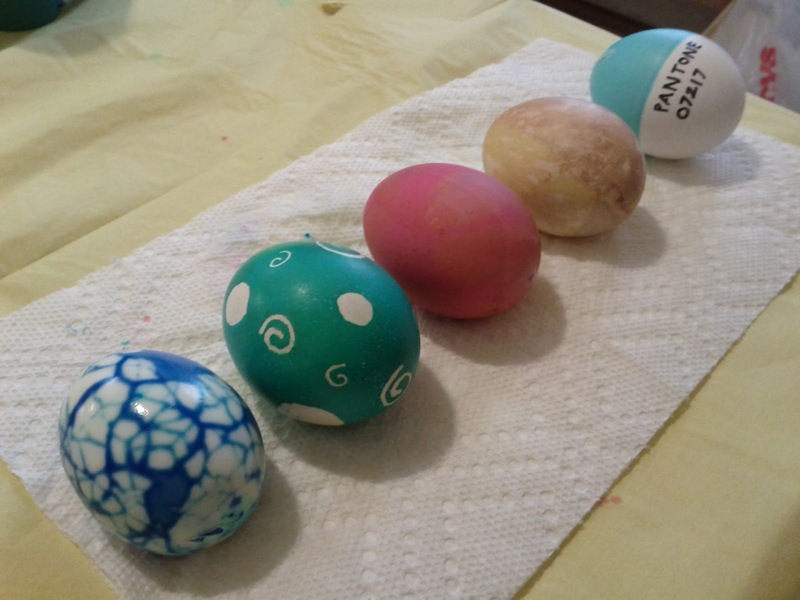 The Hollow: I got to try my hand at new-age egg-blowing, which utilized a small drill stick and an accordion pump, rather than my usual cursing jab and huffing-and-puffing light-headedness. The Onion: An experiment in natural dying techniques, where we wrapped eggs in onion skins and cheesecloth, and then boiled them for 10 minutes. When you unwrap them after, they're printed with the fantastic patterns of the onions, and the colour--use lighter skins for a brighter shade of yellow. The Dork: I saw the idea for this on Pinterest (of course), and thought it was adorable--although I still don't understand how/why Pantone colour specs have become such a cultural trend! But then, maybe it's just because I'm around so many design folk . . . Either way, I felt compelled to give it a try. I haven't really dyed eggs since I was a kid, so it was a true treat to join in the fun; with shockingly delicious Peep S'mores, to boot!